In a career that spans more than fifty years, Deacon John Moore has endured as one of New Orleans' most talented and most adaptive performers. "If New Orleans has such a thing as a musical chameleon, it is certainly Deacon John," says music writer Jeff Hannusch. A warhorse and model showman, he's entertained generations of New Orleanians, playing classic rhythm and blues, rock 'n' roll, blues, jazz and gospel. Blessed with a great voice that was trained in the church, he began singing with his first R&B band in the seventh grade. Once he began playing the guitar, learning to play by ear from the records and books he bought, he started playing professionally in 1957 while still in high school, and has never looked back. In the 1960s, Deacon, as a guitarist, began to play on recording sessions with Allen Toussaint, Dave Bartholomew, Harold Battiste, Wardell Quezergue and Eddie Bo. He became a fixture on all of the top records at Cosimo Matassa's studio in the late '50s and early '60s, playing on many classic hits—Ernie K-Doe's "Mother-in-Law," "Tain't It the Truth" and "A Certain Girl"; Benny Spellman's "Lipstick Traces" and "Fortune Teller"; Lee Dorsey's "Working in the Coal Mine," "Ride Your Pony" and "Holy Cow"; Aaron Neville's "Tell It Like It Is," "I'm Waiting at the Station" and "Wrong Number"; Chris Kenner's "Land of 1,000 Dances," "I Like It Like That" and "Something You Got"; Robert Parker's "Barefootin',"; Smokey Johnson's "It Ain't My Fault," Willie Tee's "Teasin' You" and Professor Longhair's "Big Chief," among others. Deacon, with his band Deacon John & the Ivories, was the first rock'n'roll musician to play with the New Orleans Symphony in 1970. 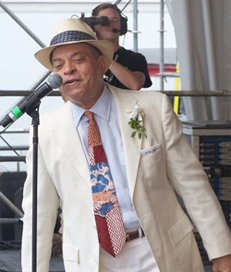 He has performed at every New Orleans Jazz and Heritage Festival, and his sets are legendary. In the 1980s Deacon's prowess on the slide guitar eventually landed him a part in Alan Parker's movie, Angel Heart, and a national television commercial for Miller Beer. In 1990, he and fellow musician George Davis released his first CD, Singer of Song, followed by his second CD, Deacon John Live at the New Orleans Jazz and Heritage Festival. In 2000, he was inducted into the Louisiana Blues Hall of Fame and taught blues music in the schools throughout the state of Louisiana. In 2003 Gambit Magazine named Deacon Best Male Performer, Best Rhythm and Blues Artist and Entertainer of the Year. Also in 2003 Offbeat magazine awarded him Album of the Year, Overall Band of the Year and Best R&B/Funk/Soul Band. At the invitation of President George W. Bush, he played at the Congressional Ball at the White House in 2005, and in 2006 Deacon was elected the first African-American president of the New Orleans Musicians Union, Local #174-496. In 2007, he was chosen to sing for the historic inauguration of Louisiana Governor Bobby Jindal. In 2008, the United States Postal Service and the New Orleans Jazz and Heritage Foundation honored him with a commemorative envelope and he was inducted into the Louisiana Music Hall of Fame. In 2009, he received a Community Arts Award from the Arts Council of New Orleans and was honored with an Asante Legends Award. In 2010, Offbeat music magazine awarded him its Lifetime Achievement Award; he also received the Cutting Edge Music Conference's Lifetime Achievement Award, and the American Federation of Musicians' highly coveted Charles Walton Diversity Advocate Award. In 2011, the New Orleans Blues Society gave him the Snooks Eaglin Lifetime Achievement for Blues Excellence Award. In 2012, he earned the Slim Harpo Blues Pioneer Award from the Slim Harpo Music Awards, and in 2013 he was awarded a star on the Tipitina's Walk of Fame. Deacon has graced the covers of many local and national newspapers and magazines. He has appeared in movies, live musical theater, and has been featured in national TV commercials, including Lincoln Cars, Southern Comfort Whiskey, Snickers Candy, Blue Cross health insurance, Capital One Bank ("What's in your wallet? "), People's Health Insurance and AirBNB. Deacon has also been in many WYES-TV documentaries on New Orleans history and culture, most recently Growing Up in New Orleans and Audubon Park Memories; he is also in Shake the Devil Off, the 2007 documentary about Father Jerome LeDoux, and the 2013 horror film, The Last Exorcism Part II. Deacon played "Danny Nelson" in the first season of HBO's acclaimed Treme. He is currently featured in the New Orleans media campaign, "Follow Your NOLA"; previously he was in local ad campaigns for tobacco-free living, "Let's Be Totally Clear"; for the United Teachers of New Orleans (UTNO); and for the New Orleans Musicians Clinic. Deacon is the star of the critically acclaimed documentary movie, Going Back to New Orleans: The Deacon John Film, and live concert DVD and CD, Deacon John's Jump Blues. Copyright © 2018 Deacon John & the Ivories.